Recently you've seen a few people use a sample MOSS 2007 WCM site that Microsoft had a partner develop them. 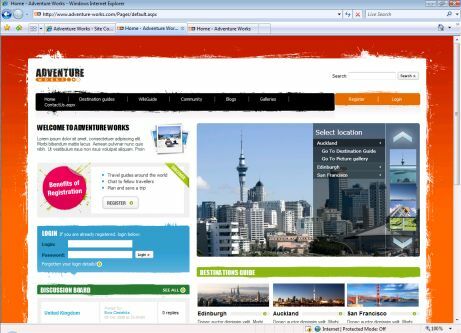 The site, Adventure Works Travel, is one that I've used in demos at TechEd EMEA in November 2008, the SharePoint Best Practice conference in London in April 2009 and TechEd US in May 2009 in addition to a few MSDN articles I've published (like this one). Finally you can download it too! The sample, used for the SharePoint On the Web training series, is now available on CodePlex MSDN Code Gallery! Best part, this is available as a download so you can install it on any SharePoint virtual machine you've setup. I like using this site for my demos as it is a real world Publishing site. There are custom Web Parts, custom styles for the Content Query Web Part, custom navigation, a custom Silverlight application that asynchronously calls back to a custom WCF service hosted in the SharePoint Web application, leverages FBA... you name it. It's a great site to poke around!